Global demand for battery materials will rise 8.3 percent annually to $46.8 billion in 2019. Chemicals will be the fastest growing materials, led by lithium and nickel used in Li-Ion and Ni-MH batteries. China will remain the fastest growing market. 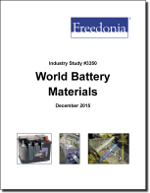 This study analyzes the $31.4 billion world market for battery materials. It presents historical demand data (2004, 2009 and 2014) and forecasts (2019 and 2024) by product (e.g., metals, chemicals) and application (primary batteries, secondary batteries) for six world regions and 16 major countries. Total demand is given for an additional six countries. The study also considers market environment factors, details industry structure, evaluates company market share, and profiles 46 industry participants, including Eco-Bat Technologies, Henan Yuguang Gold and Lead, and Umicore.